Photography is a really big part of my life. I have negatives going back to when I was in second grade. My first SLR camera was purchased with my first few paychecks from my first part-time job. I've rarely stayed away from it for long. So some books on photography have been very important to me. They probably won't be for you, unless you want to be serious about it too. (They're not necessarily advanced books, but they are serious books). In my opinion, these are the serious photo books. You can read them as a complete novice, or as an experienced amateur, and get a lot out of them. Some areas, like camera movements, are relevant only to a narrow range of expensive professional equipment (view cameras, and oddities like the Nikon PB-4 bellows or the Hasselblad Flexbody, or "perspective control" lenses for 35mm cameras); but most are relevant to everything a photographer does. And all are basic to understanding the craft. This is a wonderfully educational book. Adams takes 40 of his well-known photographs, and reconstructs as much as he can about how he took them, and why he made those decisions (and sometimes how he should have made the decisions in hindsight). As the subtitle says, this is about advanced photographic printing techniques. Most of it is applicable to color or B&W, printing from slides or printing from negatives. Much of it is even relevant to digital manipulation, though it isn't directly discussed much. It also has lots of information about choice of materials, and about techniques for printing and for testing. Maybe the most important thing I've learned from Ctein is that all the materials and tools have flaws and limitations; you've just got to learn to work with them. I haven't had this book long enough to know if it actually has improved my printing, but I believe it will, a lot. Steven Jay Gould is a biologist, with posts at Harvard and the Smithsonian Museum of Natural History. He's also one of the best popular writers on science to ever come along. Most of his books are collections of his monthly column in Natural History magazine. Before I read Gould, I was infected with the "direction" meme -- the concept that evolution somehow had a goal, that "progress" was a meaningful concept in evolutionary terms. It's total nonsense, of course; I even knew that, intellectually, but Victorian concepts like "more highly evolved" were rattling around in my skull anyway. Gould cured me. His only really serious flaw, at least that's visible by simply reading his essays, is that he's a baseball fan. But he manages to make even that interesting, in a fine essay on why the end of .400 batting averages is a sign of the improvement of the quality of play in professional baseball. All his collections of essays are very much worth reading. I've picked out a few as perhaps particularly fascinating or important. Did you know that the diversity of life on earth has decreased pretty consistently since a very early period? 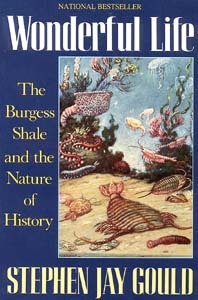 The body plans of the Burgess Shale creatures include all the modern ones, and many more besides. There's also a fascinating story in how it took so long for people to see the significance of these oldest of soft-bodied fossils. John McPhee is a very wide-ranging journalistic essayist. He goes out and meets the interesting people in a field and writes about the field, and about them. Then he goes to some completely unrelated field. He's very good at it. Any John McPhee is first-rate. Even if the subject doesn't interest you, the book is likely to. The modern American merchant marine, the part that's actually registered in America. Ultra-high-tech: nuclear bomb design. A guided tour of the field, conducted by Theodore B. Taylor, one of the best of the best, and reported by John McPhee, one of the best of the best at this kind of reporting. This was written in 1973. It hasn't gotten any less terrifying since. And why it's a bad idea. What it's really like inside the Swiss army. Last modified Tuesday, 24-Jul-2007 14:06:02 PDT.